‘Hew Locke: Here’s the Thing’ at Ikon Gallery in Birmingham will be the most comprehensive exhibition to date of work by British artist Hew Locke. Involving a wide range of media – painting, drawing, photography, sculpture and installation, including extensive use of collage and found objects – Locke explores the languages of colonial and post-colonial power, and the symbols through which different cultures assume and assert identity. Fusing historical source material with a keen interest in current affairs, often through the juxtaposition or modification of existing artefacts, Locke focuses attention especially on the UK, the monarchy and his childhood home of the then newly independent Guyana. Through appropriating coats of arms and trophies, weaponry, naval warships, public statuary and the costumes and regalia of state, Locke subtly critiques governmental authority, its iconographies and legacies. His Souvenir series of royal busts, including Souvenir 1 (Queen Victoria), (2018), are presented alongside re-workings of antique share certificates, obsolete documents referring to the turbulent history of colonial economies and their exploitative nature. In Hinterland (2013), a reworked photograph of a statue of Queen Victoria in Georgetown, Guyana, Locke hints at the country’s tumultuous relationship with its past. Removed in 1970 and dumped in the undergrowth of Georgetown’s Botanical Gardens, the statue was subjected to a kind of dethroning, symptomatic of Guyana’s then burgeoning socialist republic, only to be reinstated in 1990 in front of the city’s Supreme Court of Judicature. Superimposed drawings refer to aspects of local history, such as the environmental impact of gold prospecting in Guyana (historically El Dorado), involving the influx of Brazilian miners and the forest-wide cross-border use of mercury. Hew Locke, Untitled (2016). Acrylic paint on c-type photograph. Courtesy the artist. Photography by Indra Khanna. 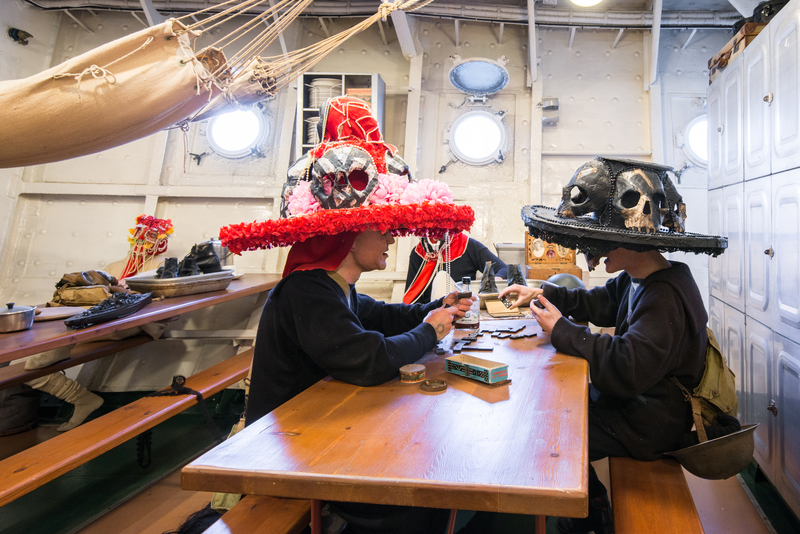 Exhibited at Ikon for the first time, the video installation The Tourists (2015) recasts Locke’s artistic intervention on board the British battle cruiser HMS Belfast. Active in the Korean War as well as World War 2, HMS Belfast visited the Caribbean in 1962, stopping at Trinidad on its final voyage. Locke conjures up an alternative history for the on-board museum mannequins, where we see them preparing costumes and props to take part in the Trinidad Carnival. The satirical gesture hints at an “exotic” alternative to the regimented daily life of sailors, whilst reminding us that ships launched in the name of western democracy and “civilisation” were essentially vehicles for unfair trade. In this vein, the finale of the exhibition presents a flotilla of customised boats, comprised of a mixture of new ships and those featured in the installation On the Tethys Sea (2017), first shown in the Diaspora Pavilion in Venice. Suspended from the gallery ceiling, intricate decorations, talismans and greenery adorn these empty vessels – with crew and passengers as absent presences – immersing visitors in a submarine environment, at once dreamlike and poignant. Born in Edinburgh in 1959, Locke lived from 1966 to 1980 in Georgetown, Guyana, and is currently based in London. He obtained a B.A. Fine Art in Falmouth (1988) and an M.A. Sculpture at the Royal College of Art, London (1994). His work is represented in many international collections including those of The Government Art Collection, The Pérez Art Museum Miami, The Tate Gallery, The Arts Council of England, The National Trust, The Metropolitan Museum of Art, New York, The Brooklyn Museum, New York, 21c Museum Hotels, The New Art Gallery Walsall, The Victoria & Albert Museum, The Imperial War Museum, The British Museum and The Henry Moore Institute, Leeds. 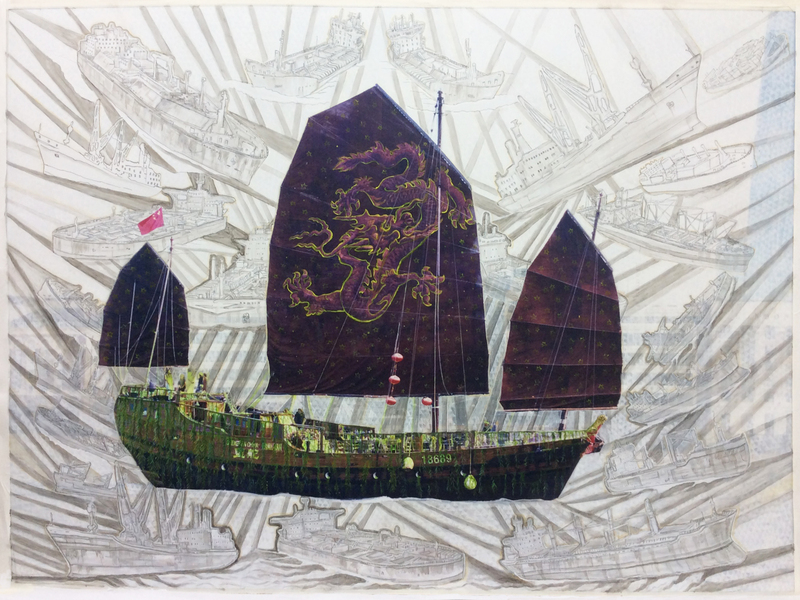 Hew Locke: Here’s the Thing will run from 8 March — 2 June 2019 at Ikon Gallery in Birmingham. The exhibition will then tour to Kemper Museum of Contemporary Art, Kansas (12 September 2019 – 5 January 2020) and Colby Museum of Art, Maine (February – June 2020). P.S. You can take a look at 9 other Birmingham exhibitions which I recommend for 2019 here. Social prescribing | Can the arts cure anxiety & depression?